Being a twin is unique and so are we !! We both love music all sorts of music, depends on the mood what kind. Check back we’re really interesting and entertaining and you may have fun getting to know us. Hello dear twins, I just tagged you and you’re It! Thanks so much Dolly for the good wishes. You please feel better, too and take care! I know, weather changes are not the best for our health it seems. Hey guys where are you? Don’t worry Soma! I have a bad cold and Autumn had a couple more complications with her sinus mess. I am getting ready to publish something soon, but Autumn may not be up to answering comments. Thankfully her darling man is looking after her pretty well for now. You know what I’m saying, because you know how caring and loving he is. That was a sweet little message from the cliparts and I am sorry to have worried you. 😦 You are so thoughtful and what a wonderful friend you are, missing us and our posts. Give me a few minutes and something new should hopefully appear! 🙂 Love and Hugs! Tag! U both are it!! Thanks, Aliza 🙂 Gabby and I have been very sick, so are quite behind on things. We’re not feeling great yet, it’s a bad winter here 😦 a lot of sickness. awww 😦 don’t worry….and GWS! Hi Twins! 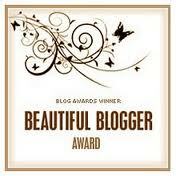 Must say your blog is amazing! I noticed that you know Poetic Journey, People Stories and Have a dream! They are 3 great friends of mine. Would love to get to know you two, too! Will be continually dropping by to see more of what you have in store. Thanks for stopping by my blog and liking one of the posts…and what do you know, I have 2.5years old twin girls :). 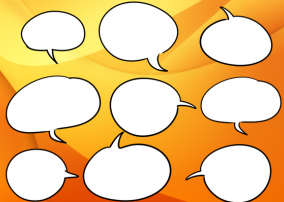 Well, seeing how I really love all you write…. 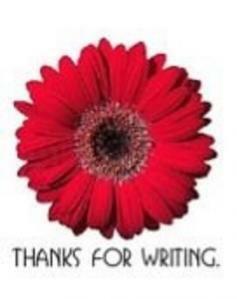 I have nominated you for the “Thanks for writing Award”. You’re very welcome 🙂 mmwah! 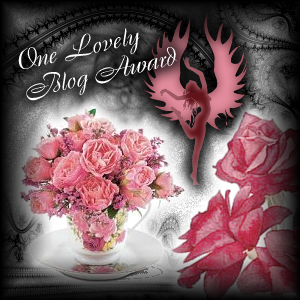 Hi, I nominated your blog for the One Lovely Blog Award. I know Gabby is recuperating right now so it’s okay if you don’t accept but just to let you know I enjoy your blog. Thanks. Have a blessed day to you both! Gabby, I may have been remiss in welcoming you to The Sun Drips Honey, and if so, I’m very sorry. I welcome you both, and you have my deepest thanks for your support. The two of you know me well enough, now, that I know you will understand when I ask you to be specifically honest, rather than kind, in your comments. I value you both so very much, and I am thankful every day to see your names in my inbox. 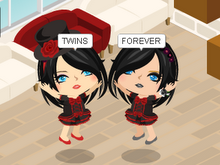 Hi Twins! 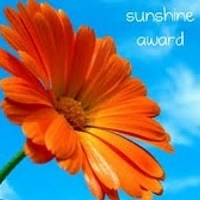 I nominated you both for the one lovely blogger award even though you already have it. You are very inspirational and have been so helpful to me too. Thanks again. I’m so glad. You both deserve it! You both deserve it. It’s only natural! I love your sketches 🙂 I’ll be back, but as of right now am having problems leaving comments 😦 hopefully WPress will get that resolved.